Stress is a killer plain and simple. You must first learn to recognize the signs that you are indeed responding to stress and in order to do that you must begin paying attention to and listening to your body. If your heart is racing, you suddenly feel flushed and begin to sweat or you feel edgy and angry you are likely having a stress response. Although meditation is one of the top exercises to calm your mind and release stress, it is not always appropriate to begin meditating the second we feel our “stress response.” So, what do we do? First you must trick your brain into understanding that the situation you find yourself in is not as threatening as your first reaction. Begin thinking something positive and shift attention away from the threat. This helps to dampen the stress response. You can bring to focus in your mind an image, a memory, an event…just anything that you can quickly focus your attention on that you find pleasant and soothing. The goal of your stress responses is to mobilize energy in anticipation for the fight or flight that will likely ensue. This is the energy you must divert in a different direction…if possible take some deep breaths and a nice long walk…even walking up and down a flight of stairs will do the trick of releasing that “fight or flight” energy. If you are currently stuck in a situation that will not allow you to be mobile at the moment then use your breath. Breathe in deeply several times, contract and release your abdominal muscles. If you are taking short, shallow breaths you are signaling anxiety in the brain and body. At the moment it may seem as though you are wasting precious time but you’ll actually be preventing the decreased production you will likely experience if you don’t deal with your tenseness, your stress and your worry. Learn to smile in the face of adversity. Studies reveal that laughter does reduce symptoms of depression and anxiety. If you need some help calming jittery nerves…just watch something funny on YouTube to get your mind on something else and lift your spirit. Adopt the attitude of gratitude. Gratitude is an empowering attitude that helps to reduce anxiety. Gratitude journals are a great way to keep your mindset in “appreciation” mode and away from overwhelm. Learn to still your mind. The practice of meditation is an exercise that will go with you once you become adept at it. When stress knocks at your door your mind can go to that familiar place when meditating. Meditating allows us to observer how the mind works and how it generates anxiety-provoking thoughts. Learning to meditate puts you in touch with those areas of yourself that eliminate stress. Scientists are not discovering that mediation actually increases the amount of grey matter in the brain…essentially rewiring the body to stress less. Get plenty of sleep. Lack of proper sleep not only affects us physically, but contributes to overall anxiety and stress. If you are in a particularly anxious situation at present…give your body a boost by scheduling some extra zzz’s. Start playing again. Watch children and get back to their innocence and away from your worries. Do something that makes you happy inside…even if you think you don’t have the time. 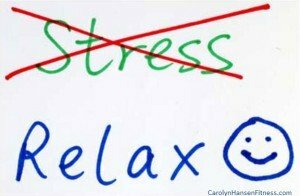 What you don’t have time for is to allow your body to fall victim to stress and anxiety. Take my 1 minute Cancer Risk Test to find out where you fare on the cancer risk scale you can. Knowledge is power.